Ammonia is commonly compared with bleach as an effective mould killer because they’re both effective cleaning solutions, and commonly found in many household cleaning products. But also, they’re both very good at killing mould on non-porous surfaces like glass and tiles. Like bleach, Ammonia is a harsh mould killer that is extremely potent, but effective on hard surfaces. However, also like bleach, it has a tough time killing mould on porous surfaces, such as fabrics, wood, sheet rock or drywall. To kill mould effectively, you have to attack the root level, and unfortunately ammonia is not the best at that. If you’re trying to kill mould on porous surfaces, you might be better served using something like vinegar, baking soda or hydrogen peroxide– all excellent mould killers that attack the root level, and all of which are non-toxic, and natural and environmentally friendly solutions. Open windows to help fumes/vapours to disperse from Ammonia solution. Mix ammonia and water together, equally split. Pour solution into a spray bottle and shake well. Generously spray solution over the infected area. Allow the mould killing solution to sit for 10 minutes. Wipe and rinse area, and use scrubber/toothbrush on stubborn mouldy areas. Ammonia is a extremely harsh and toxic chemical, which is a skin and eye irritant. If ammonia fumes are inhaled or the agent is swallowed, it can be extremely lethal, so it is important to take extra care, and wear all the appropriate protective clothing, such as gloves, glasses and a respirator. A well ventilated room is also essential. 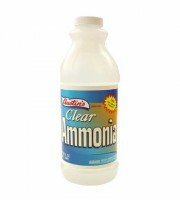 Never mix ammonia with bleach because the gas they create when combined is extremely toxic.